We are happy to introduce, for the first time ever, the Lone Mountain Wagyu Flank Steak. If this is your first time with flank, rest assured, your beef prep repertoire is now a long way to golden. It’s a versatile cut. And when marinated with some bold flavors and then cut thin sliced “on the bias” (aka at an angle), you’ll be just … as biased as we are about the smash hit potential of this cut. Remove the steaks from the marinade and place onto the grill. Cook untilthe internal temperature reaches 135f, flipping the steak every 3 minutes. This should take approximately 10-15 minutes all up. Once the steak is at the correct temperature, remove it from the grill, cover loosley with foil and rest 10 minutes. 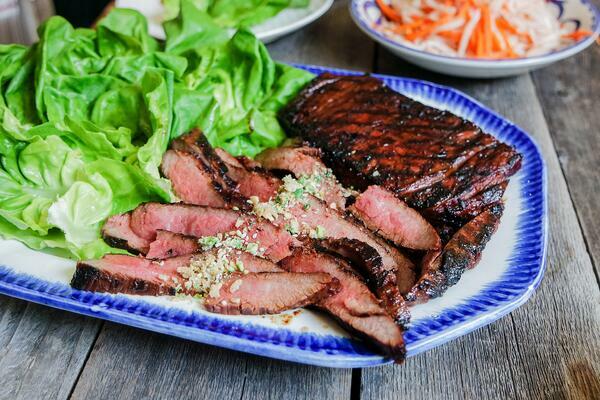 6.Slice the flank steak against the grain, and serve with lettuce cups, Korean pickle, crushed peanuts and fresh lime.